This page provides basic knowledge about the medical procedure known as a hysteroscopy. This procedure is usually done for the same reasons as a DD&C. The endometrium is directly visualized. 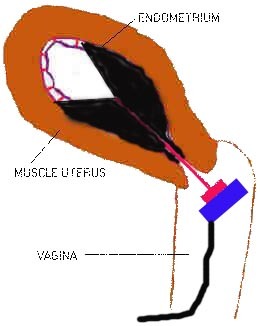 An optic lens instrument attached to a television camera is introduced in the cavity of the uterus and the endometrium visualised on a TV monitor. As explained elsewhere the endometrium ( the internal lining of the womb) is the site where menstruation takes place. The changes occurring in this layer caused by the hormones estrogen and progesterone determine when the menstruation is going to start , how heavy it will be and when it it going to stop. Analysis ( microscopic examination) of this layer will give important clues about the the hormonal status. A clear image of the endometrium is seen on the monitor. Biopsies ( small pieces of tissue obtained by special instruments called biopsy forceps. A curettage of abnormal part (scrape) can also be done . (see DD&C. Ovulation It is is also indicated in infertility to determine if the female partner ovulates and to judge if the endometrium is properly prepared to embed the embryo. Refer to Early Pregnacy and Implantation . A Graphic Presentation of the Procedure Known as a Hysteroscopy. The next drawings show how a hysteroscopy is performed. It shows the instrument in the uterus. It is connected to a video camera and the wires connecting the camera to a monitor are also shown. Remember that it is completely dark inside the uterus and the hysteroscope must have a light source to illuminate the inside of the uterus. Here is a video clip illustrating the normal endometrium at about five days prior to the onset of a menstrual period in a normal ovulating woman.